Symach is reinventing the way body shops operate with its unique FixLine system. The Italian-based company, known for its high-quality equipment, is building body shops around the world using this innovative repair process. There are currently 46 shops using the FixLine process in Australia, North America, Europe and the Middle East. 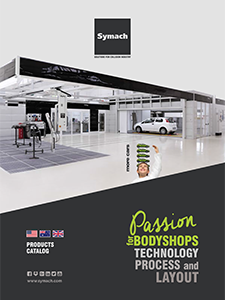 Established in 2001, Symach offers a wide range of equipment and technology aimed at increasing productivity and efficiency in body shops. The FixLine system consists of a layout and repair process that combines the company’s patented Drytronic technology, specialized drying robots and the Symach Paint Application Process (SPAP) painting cycle. “Compared to conventional methods, the FixLine system reduces the average cost of repair by 25 percent and the key-to-key time to approximately two days,” said Osvaldo Bergaglio, CEO of Symach. FixLine includes all phases of repair and is customized for every shop to ensure a more organized workflow and optimal repair times. There are three different layouts and repair processes, which are segmented based on the amount of damage and the number of panels involved in an accident. “This makes it possible to optimize each phase of the repair, the skills of the technicians and the equipment,” said Bergaglio. “It also maximizes quality, efficiency and production.” The FixLine conveyor allows a continuous workflow throughout the day, allowing a shop to use approximately 30 percent fewer technicians than a conventional shop to repair the same number of cars per day. It is available in two different configurations. The SprayTron has the capability to repair 10 cars per day with one painter; the KombiTron can repair 20 cars per day with two painters. Symach is one of the first companies to have produced a robot for drying paint. The FixLine process uses the robots for body filler, the preparation of primer and for waterborne and clear inside the paint booth. The company also developed a specific paint process called “SPAP,” Symach Paint Application Process. “It can save 60 percent of the application time compared to the conventional paint process and every brand of paint can be utilized” said Bergaglio. As part of the FixLine system, Symach assists with the design of the work process and body shop layout, which usually requires at least 30 percent less area compared to a conventional layout. The company also conducts a training program for technicians and management that includes programming roles, daily scheduling of repairs, correctly managing spare parts flow, maintaining a weekly report and addressing KPIs.